With its March 2015 issue, Inside Golf’s multitude of passionate readers will enjoy an expanded 128-page offering which, in addition to an 88-page golf magazine, includes two highly-popular national lift-out supplements, Inside Golf Travel and Inside Golf Corporate Golf. The issue, which is available free to golfers at over 420 golf clubs and driving ranges throughout Australia, marks a milestone for the monthly publication, which since its launch in August 2005 (then at a mere 36 pages) has enjoyed a steady and continuous growth in size and circulation. Inside Golf has remained Australia’s highest audited circulation (CAB) publication for over 9 years, with the most recent CAB-audited circulation (Apr-Sept 2014) numbering 42,265 copies (representing an estimated reach of approximately 105,662 readers). In addition to its flagship print product, Inside Golf has continued to thrive via its highly-successful online channels. The interactive IG Digital version (published online via Issuu and RealView Rapid) receives over 18,000 monthly views, while Inside Golf’s popular iPad/Tablet App has been downloaded and installed on thousands of mobile devices via the Apple App Store. 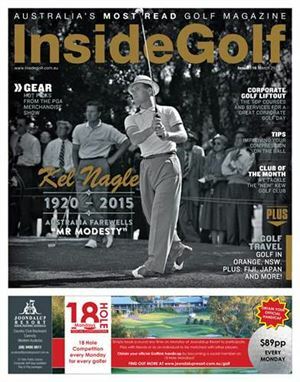 Inside Golf’s website, email newsletter, Social Media, RSS Syndication and other publishing and promotional channels help complete the offering, providing Australia’s most complete, full-coverage golf publication. Inside Golf’s popularity among golfers in Australia is due in part to its unwavering commitment to deliver a wide variety of high-quality, home-grown Australian golf content, written by a trusted and passionate team of award-winning writers, journalists and columnists. In addition, the Inside Golf readership base has grown to one of Australia’s most diverse and passionate communities in the industry. The magazine’s recent 2014 Readership demographic survey reflects an extremely wide reach of golfers across all ages, skill levels, occupations, regions and income. Inside Golf’s readers are an exceptionally loyal group who read the magazine each and every month, and use the magazine extensively to make golf purchasing decisions. They also play a tremendous amount of golf, with the vast majority considered “Avid Golfers—the highest possible level of play as defined by the golf industry.